The Old Town of Corfu, on the Island of Corfu off the western coasts of Albania and Greece, is located in a strategic position at the entrance of the Adriatic Sea, and has its roots in the 8th century BC. The three forts of the town, designed by renowned Venetian engineers, were used for four centuries to defend the maritime trading interests of the Republic of Venice against the Ottoman Empire. In the course of time, the forts were repaired and partly rebuilt several times, more recently under British rule in the 19th century. The mainly neoclassical housing stock of the Old Town is partly from the Venetian period, partly of later construction, notably the 19th century. 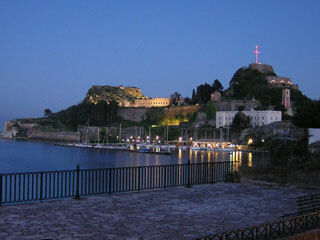 As a fortified Mediterranean port, Corfu’s urban and port ensemble is notable for its high level of integrity and authenticity. This article uses material from UNESCO World Heritage List article "Old Town of Corfu", which is released under the Creative Commons Attribution-Share-Alike 3.0 IGO License.